B. What role do southern Democrats in Congress play? D. Kennedy—the death of a dream? E. Freedom Summer and Mississippi Burning…. 1. What IS it with the French? 2. “Brushfire wars”—where and why? 1. How did we get into Vietnam? E. What was the purpose of the Alliance for Progress? G. In the end, how do we assess Kennedy? 1. What is affirmative action? 1. What were the main programs? E. How does Vietnam eventually bring LBJ low? F. In the end, how do we assess Johnson? 6. How do you “save” Vietnam by destroying it? V. Nixon? During the Counterculture? Why? You can read the speech as you watch for full effect. What does the elephant symbolize? What does the tower of tar buckets imply? 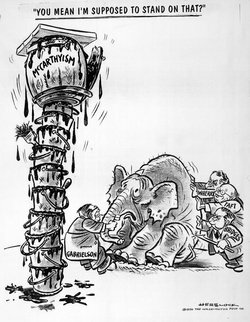 What is Herblock basically saying about McCarthyism?